Join us on a small group morning tour from Rotorua. In the morning we pick you up from your hotel/accomodation in Rotorua and take you on a morning of discovery and intrigue. Your driver will give you full commentary along your journey. 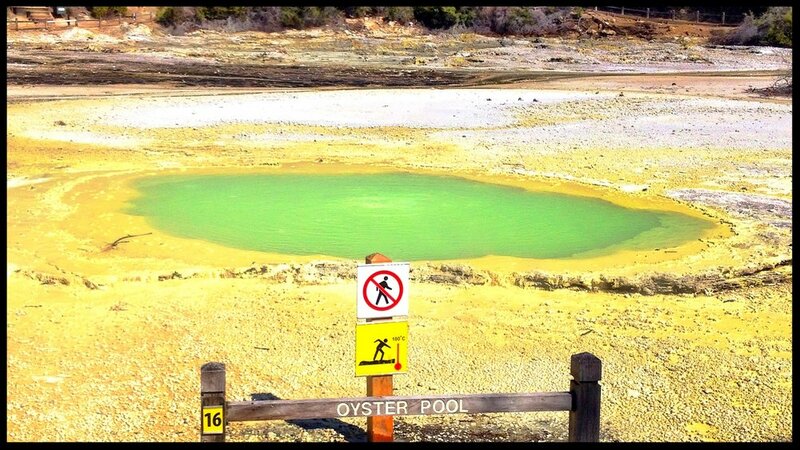 We visit Wai-O-Tapu Wonderland. Here you will witness The lady Knox Geyser, the largest hot bubbling mud pool in New Zealand, Champagne Lake, volcanic craters, steaming lakes and much more. Being a small group tour, makes for a more friendly and personal service & your driver/guide will give you full commentary along your journey on interesting facts and information about New Zealand. We travel south through deep forestry and farmlands along the thermal highway as we make our way to our first destination. Along your journey you will see steam escaping from the surrounding area, coming up through the bushland. This is a real sight to see!! We also pass Rainbow mountain an active geothermal mountain with coloured rocks and native plants that are unique to geothermal environments. On arrival at Wai-O-Tapu we make our way to the largest hot bubbling mud pool in New Zealand this was originally the site of a large mud volcano which was destroyed through erosion in the 1920’s. Next stop is the Lady Knox Geyser, Listen to the guide in the outdoor amphitheatre as they tell you all about the history and give you factual information on the area and the geyser. Lady Knox Geyser provides a unique opportunity to see an eruption to heights of 10 to 20 metres. We take a short journey to Wia-O-Tapu geothermal wonderland to experience volcanic activity, thousands of years in the making, Wai-O-Tapu is considered to be New Zealand’s most colourful and diverse geothermal sightseeing attraction. Clearly defined walking tracks provide you with the opportunity to enjoy the diversity of this area through a series of different walks taking from 30 to 75 minutes. Each track provides their own unique volcanic vistas to fascinate all ages. After your walk there plenty of time to enjoy some souvenir shopping or grab some lunch and a coffee! This tour includes pickup, transport, entrance fees to Wai-O-Tapu then return drop off back to central Rotorua.